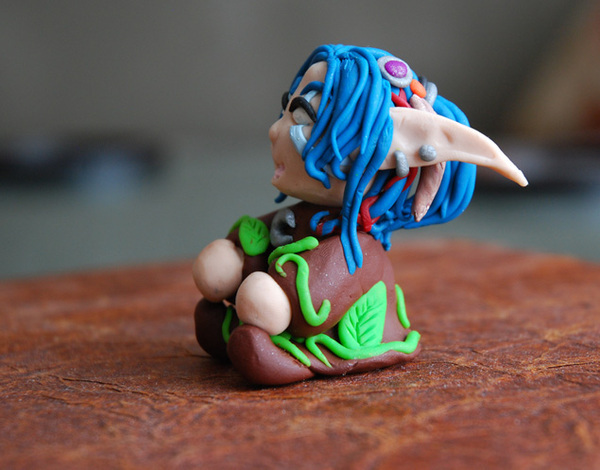 Sometimes art day is a drawing, sometimes it’s a teeny druid made out of Sculpey. Today is the latter! Shaedre is my druid, once a main, now an alt – once a character I roleplayed, now one I just think of fondly. 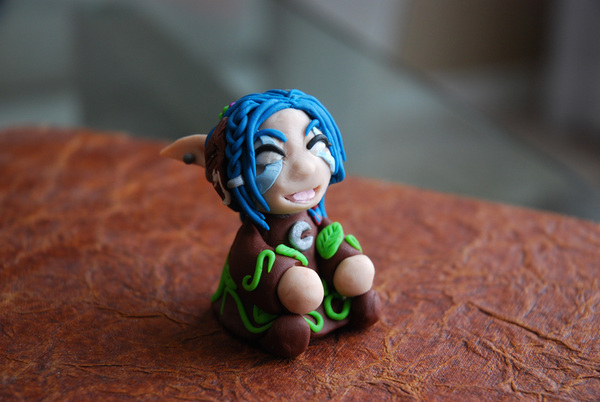 Her hair has an assortment of different junk in it at any given moment.Weaving her braids was fun, and she’s probably the most complicated Sculpey figurine I’ve made to date. Edited to add: You’ll notice some of these photos have Easter eggs in them! They were part of my participation in the Great Blog Noblegarden Egg Hunt. The original images are the ones without. From this angle you can see some of her hair ribbons. A few other miscellaneous things for this Tuesday – I’ve been extremely gratified overall by the response to my post the other day. If you visit the comments there are quite a few pingbacks and people have been sharing their new blog finds. It’s very exciting and my feedreader is going to be expanding over the next few days for sure! Secondly, I occasionally use this space as a way of promoting my guild a bit and it’s that time again. We found a great holy paladin back in February, he’s settled into the guild quite nicely – but now our Death Knight tank has been pulled away from raiding by real-life. So we are recruiting again! We’d like another DK tank if at all possible but would also give consideration to a druid, paladin, or even a warrior (although a warrior would be a bit more complicated). If you or anyone you know is looking for a great tens guild, we raid Monday, Wednesday, and Thursday from 6-9 PM PST. We’re currently 2/13 heroic mode encounters and we’re so close on Maloriak we can taste it. (Tastes kind of sludgey, actually). You can read our recruitment thread here, or visit our guild website here. 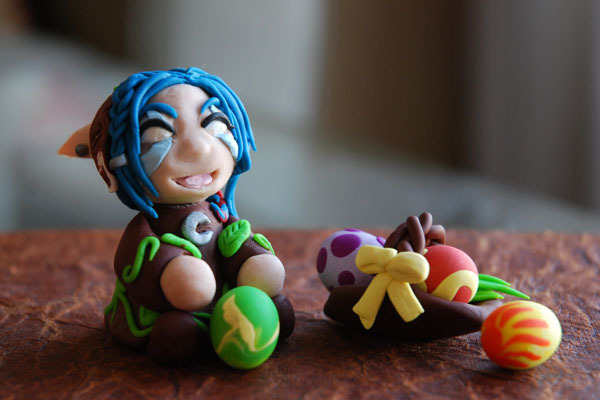 Feel free to ask any questions either on the blog or you can poke me on Twitter (@_vidyala) or via e-mail. Thanks! I’m generally a very empathic person, and that’s true in my ‘real life’ as well as my gaming one. When it comes to board games, my friends know I’d rather play one where we all work together rather than compete. It’s a big reason why I took to MMOs so readily. Oh, I’ll PvP sometimes, but what I love about MMOs and what I love about WoW is working with a group of other people towards a common goal. It’s kept me engaged in this game for almost three years. When you laugh, I laugh with you. When you cry… sometimes it’s hard for me to recognize that the reason for your tears isn’t actually anything wrong in my life, I become so upset on your behalf. I’ve been thinking about this. I’ve been struggling to write here, not for lack of ideas – I’ve started at least six blog posts over the past week, each one that I think would make a great post! But I get distracted, and I don’t seem to be able to finish them. My writer’s block is not the same thing as being ready to leave or ready to stop, although I think it could have picked a better time. (Is there ever a good time for writer’s block?) I’m sure it’s especially difficult to be one of the ‘old guard,’ bloggers who have been at this for many years. It’s always tough to see your contemporaries leaving. That feeling of loss and uncertainty has threatened to drag me in, too, but I realized something today. I still have things to say. I still have people to talk to, and the WoW community brings me so much. You’re not even remotely done listening to me ramble, and I think that’s okay. In the wake of Tam leaving, and again with Larisa’s decision to stop blogging, I’ve heard people say things like “We can’t ever be the same without them,” or suggest that the end of their blogs is somehow a sign of the end. It’s bothered me that some comments seem to be that there will be nothing of quality left. In a way, people are right. The community can never be exactly the same as it was when Tam brought his philosophic ramblings to bear on it. 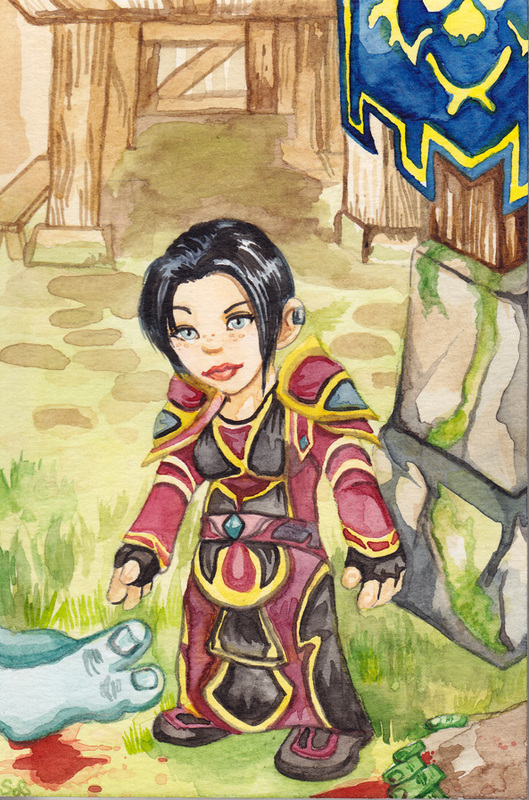 We will miss Larisa’s cheerful hearth. It won’t be the same, because it’s going to be different, but not because it’s ending. New bloggers are opening their doors all the time. Some of us are still going strong and nowhere near ready to quit blogging. There was a series of blogaversies that has stretched from December through January, and these are the people whose enthusiasm for blogging I have shared, contemporaries and colleagues, friends and friendly rivals. We haven’t gone anywhere, our voices are still here. Don’t miss reading an excellent blogger because he/she isn’t a blogger that’s come before. We can’t duplicate the exact approach or personality of those big names, but there are plenty of us still well-worth reading, and new ones joining our ranks all the time. The unfortunate thing with being empathic is that it’s easy to read others with complaints or feeling tired about the game and to “catch” that feeling. Then you start to wonder if it’s you, too, if it’s just time to move on, if you’re finished. It’s okay to wonder that, and it’s okay to stop blogging too. But make sure if you do that it’s actually your feeling you are addressing, and not just a reaction to change. I hate change, myself. I hate when voices I’ve come to expect are no longer here for me. But I also feel that there are many voices left that I love listening to; many of us with a passion for the game and the words we write about it. I have a challenge for you, whether you are a blogger or just someone who enjoys reading blogs. If you’re a blogger: Find a new blog today that looks promising, that you enjoy. Link to it on your blog. Leave an encouraging comment! The Blog Azeroth author introduction forums are a place where new bloggers can introduce themselves, and you can surely find a gem there. What I’m talking about doesn’t even have to be a new blog, though, even just ‘new to you!’. You can find great treasures in people’s blogrolls if you browse around. Link love, recognition, and feedback are what make us more than just a random grouping of people talking to nobody in particular. They keep us together, they make us a community. Instead of being upset that some of the paragons of the community have moved on (although of course, pay them a respectful, loving, or tearful farewell) – today I intend to focus on people that are still here. It’s our attitude and recognition of each other that will ensure we continue to be engaged and enthusiastic about blogging. For my part, I’ve started reading Stubborn over at Sheep The Diamond recently, and I’ve found his words funny and insightful. His is a new voice I’ve been quite glad to hear! Here’s my second challenge, for non-bloggers. If you have found a blog recently that you enjoy reading, if you appreciate the content there – whether it’s guides, points of view, or just something to make you laugh – leave a comment. It doesn’t have to be a LONG comment, and you don’t have to leave twenty comments a day on various blogs. But taking the time to comment is a huge part of what encourages bloggers to keep going. Knowing that people are reading but not saying anything can be worse than knowing that nobody is reading. Even if it’s just a comment saying, “Thanks for taking the time to compile this information, it’s been really helpful.” Knowing that I’ve helped someone, or made them think or even just brought a smile to their face makes my day. It’s part of what has kept me blogging for over a year, and why I see myself continuing to blog in the future. I don’t know any bloggers that don’t love to receive a comment. We thrive on it, because it lets us know that people care about what we have to say. So leave a comment, link a blog, read a blog, and remember that there is a vast community of players of all stripes writing about a multitude of topics – and that’s what makes our community so awesome and will keep us strong for a long time to come. I’ve been seeing a disturbing mage trend lately. Sometimes folks send me armory links (their own, a friend’s, a guildmates’, whatever). Sometimes these armories reveal things. Horrible things, people. Mages with strength shoulder enchants. Mages with all blue gems. Although I’m primarily concerned with Fire these days, Intellect is the strongest stat for all mage builds. But it’s not aimed at them and so statements about secondary stats (crit, haste) may not hold true. Use at your own risk, your mileage may vary, etc. Gemming a fire mage is simple! 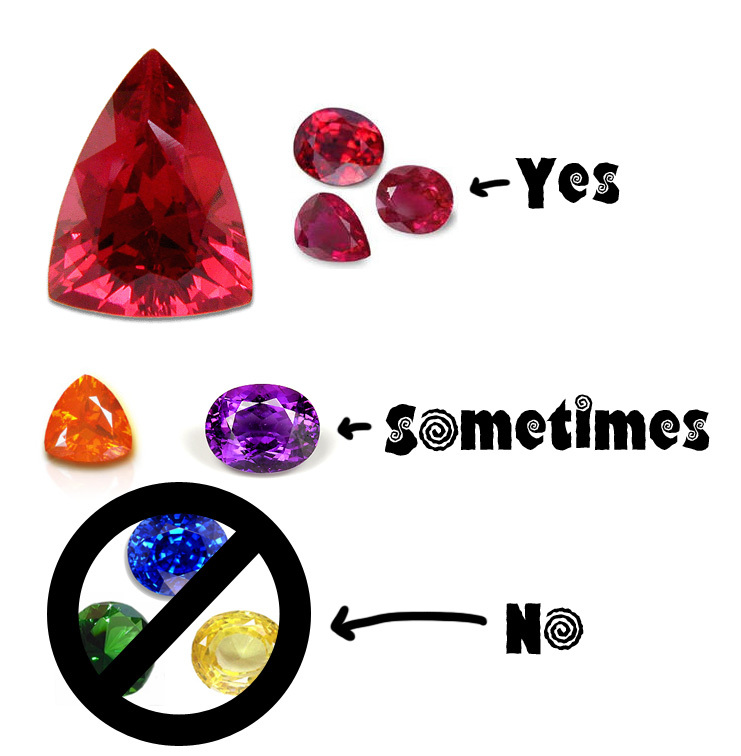 You want Brilliant Inferno Rubies. Lots and lots of Brilliant Inferno Rubies. Intellect is far and away our most powerful stat. A red socket? Put a red gem in it. So many beautiful red gems. Now this next part is, I think, where many mages get tripped up. It’s extremely tempting when you see a socket of a particular colour to want to put a gem that will match that colour. We’re taught this as kids, right? Sorting games, matching games, all your crayons colour-sorted (okay, maybe that was just me). Whenever you’re gemming any piece of gear, take a critical look at what you stand to gain and lose. For example, take these Firelord’s Gloves. They have a yellow socket. The socket bonus is +10 Mastery, which you could achieve if you used an orange Reckless Ember Topaz. In that case you’d have +20 Int, +20 Haste, and +10 Mastery. But it’s not worth it. You’re losing 20 Int by not gemming an Inferno Ruby, and Int should be your priority. Now let’s look at another piece of tier gear, something a bit trickier, the Firelord’s Leggings. Now these have a red socket (no brainer) and a yellow socket. But look at the socket bonus – it’s +20 Int. You could put an Inferno Ruby in each socket and you’d have +80 int gain from gems. Or, if you put a red (+40) and an orange (+20 Int/+20 Haste) you’d also meet the socket requirements so you’d have a total of +80 Int and +20 Haste. In this case you stand to gain by using an orange gem, but unless the socket bonus on a piece is 20 Intellect or greater, it will almost always be a DPS loss to gem other than red. I’m anticipating you here. But what about hit gems, you say. I’m so far below the hit cap, I can’t possibly hit the cap without using gems. I still stand by no blue gems, period. At the beginning of the expansion when our meta gems were loopy you could argue a case for blue gems. The hit cap can seem a distant goal. First, you have to be familiar with other ways to reach the hit cap. Investigate hit trinkets (like the one from Tol Barad) and reforge your weakest stats to hit on all your gear wherever possible. For fire mages, this means mastery. Reforge mastery because it’s really not great. Seek gear with hit on it, and see how close you are at that point. If you’re close, consider that you may be hit-capped and you will do less DPS than a mage who is not hit-capped but has more Int. I know, it’s radical. We’re bludgeoned with hit cap this and hit cap that. And don’t get me wrong, it’s important to reach the hit cap. But hit is only important up until the point where it isn’t – and perhaps even close to that point. Over the past month my hit has varied from between about 16.5% and 17%. Having all of my spells hitting harder (with more spellpower, more int!) is, I believe, better for me than killing myself to reach the hit cap. Look at everywhere you can obtain hit (enchants, reforging, gear) and seek it through those avenues first before devoting your gemming to it. In any slot where you are sacrificing potential Intellect, realize that you will be hurting your DPS. Much like the Firelord’s Leggings above, there will sometimes be pieces of gear where having a purple hybrid gem to gain a socket bonus IS worthwhile. In these cases, by all means, use an Intellect/Hit gem. That extra twenty hit will be invaluable and it’s just icing on the delicious intellect cake we so love to conjure. Gem red, unless the socket bonus is equal to what you’d stand to gain from gemming red anyway. Grab as much Int as you can. Reforge your gear to gain the hit you need and seek gear with hit already on it. Remember the in-game tooltip shows you how much hit you have versus various level creatures, and you only need 17% hit if you’re going to be raiding. Your DPS might be higher if you aren’t quite at the hit cap even for raiding, but use this advice with caution. It’s one of those ‘you have to know the rules before you can break the rules’ things. If you just want to run 5-person content, load up on Int and never look back! The other day the most excellent Kurnmogh of Kurn’s Corner asked on Twitter if a tens raider wanted to be on the podcast she co-hosts with Majik, Blessing of Frost. I was excited to have the opportunity to talk (and talk, and talk, if all the editing Kurn had to do is any indication…) about one of my favourite topics: 10s vs 25s! The title is a little misleading in that we really weren’t debating which one is ‘better’ per se but just talking about some of the challenges they face. So if you are at all interested in that, you can find the show over here, and then you will know what I sound like (lucky you). The first part of the podcast was recorded on Monday but mid-way through Kurn’s entire building lost power because of a fire nearby and someone was stuck in an elevator. We rescheduled to continue on Wednesday and in-between I caught a heck of a cold. I drank juice and lozenges and hardly talked all day long just so I could save my voice up for the last part of the podcast, so if I sound weird – I blame that, and I think that both the fire/elevator/cold were all caused by the fact that it was the thirteenth episode of Blessing of Frost. I’m not usually superstitious, but clearly there’s something to this theory. I had a lot of fun talking to Kurn and Majik and seeing a bit of “behind the scenes” at BoF. They are great folks and I appreciated the opportunity to join them. I also owe a thanks to my friend Walks who urged me to volunteer to be interviewed. It was definitely outside of my comfort zone but I am really glad I did it. I can’t resist a gnome pun! I'm not actually sure if troll blood is red. This was a watercolour, post-card sized image commissioned by Jed for his wife. I had to keep it under my hat until he’d actually given the gift, lest I spoil the surprise! He talks about it here, but I realized I’d never put it up on my own blog. I felt quite gleefully that such retribution was called for after Liala at Disciplinary Action made this comic. I may or may not have linked it before, I can’t remember, and I’m not still bitter really except this is what happens when you kill my people. Small, gnomish death rays. 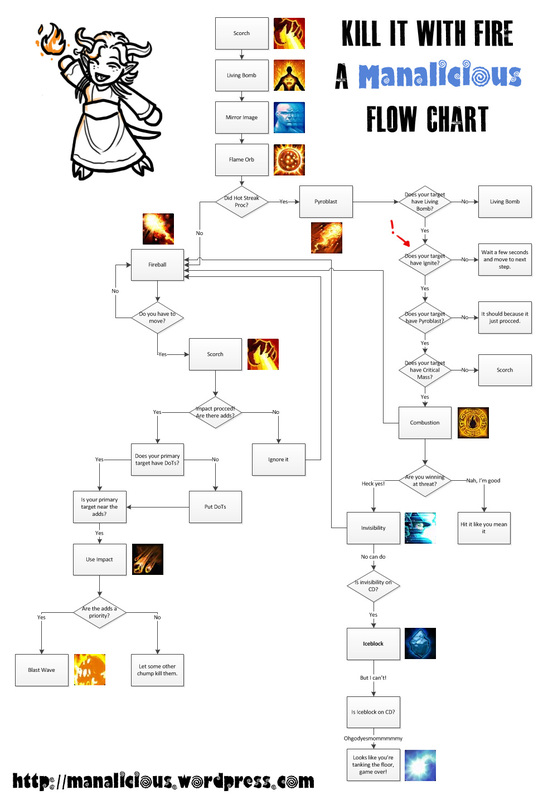 I have to thank Runzwithfire for the idea of making a flowchart – although I hear he’s more Runzwithfrost these days. I didn’t want to make a frost chart, so I made a fire one instead. Read this with a few caveats. This is primarily for single target fights. The chart does mention adds in a roundabout way, but they are not prioritized. This changes for special cases, e.g. Halfus Wyrmbreaker’s heroic mode. Because of the debuff on Halfus and the nature of Impact procs as well as the need to DPS the whelps, Impact becomes much more important in this fight. But for the majority of boss fights, this is what you’ll do. I’ve never made a flowchart before so it may not work in a perfect loop. When in doubt, cast Fireball, and never stop casting something. The initial “rotation” works because it’s stuff you can do as you are moving into position. Scorch on the move, put up LB, summon your orb and your mirrors and then go to town. Always keep as many dots as possible. Never cast Combustion without Ignite. If you’ve been very unlucky with hot streak you may cast it without Pyroblast, but never without all your other buffs! I assume any on-use trinkets will be used along with your main nuke. It’s beneficial to refresh DoTs when a trinket procs to give you more Int/Spellpower but that’s beyond the scope of a flow chart. Combustion Helper is an excellent addon for fire specs to easily manage all those DoTs, I highly recommend it. So there you have it, my first flow chart! Thanks to Voss for help with Visio thing (ridiculously easy to use). They’re fun! It got a little bit silly at the end there. An art Tuesday is a pretty easy post for me to do, because I’ve usually got a few things kicking around that haven’t been posted here. Although if you happen to follow me on Twitter you may have seen this. 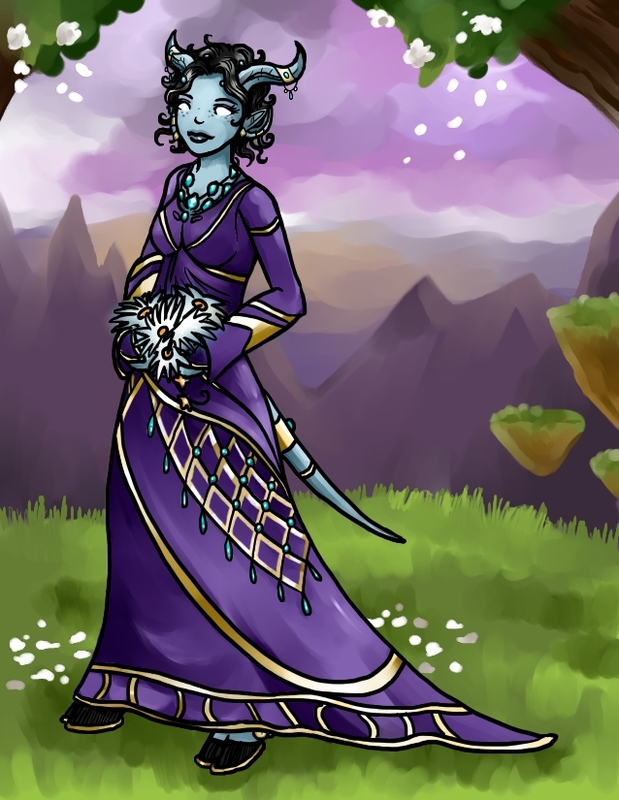 Of course I don’t know if this would be traditional so much as “What I think my own specific character would wear.” I think purple (classic draenic, natch) – pretty modest but with plenty of jewelery and other ornamentation. I’m not a fashion designer but I’m happy enough with this – along with a bouquet of Dreaming Glory to top it all off. If you don’t like draenei (what’s wrong with you?) what do you think your favourite race would wear to their nuptials/racial equivalent? Yes, including hoof-shoes. Why not?